Veterans included Freeman "Buzzy" Buzzell, Philias Johnson, William Burkhart, Frank Dore, Basil "Bud" Andrews and Robert Chadbourne. 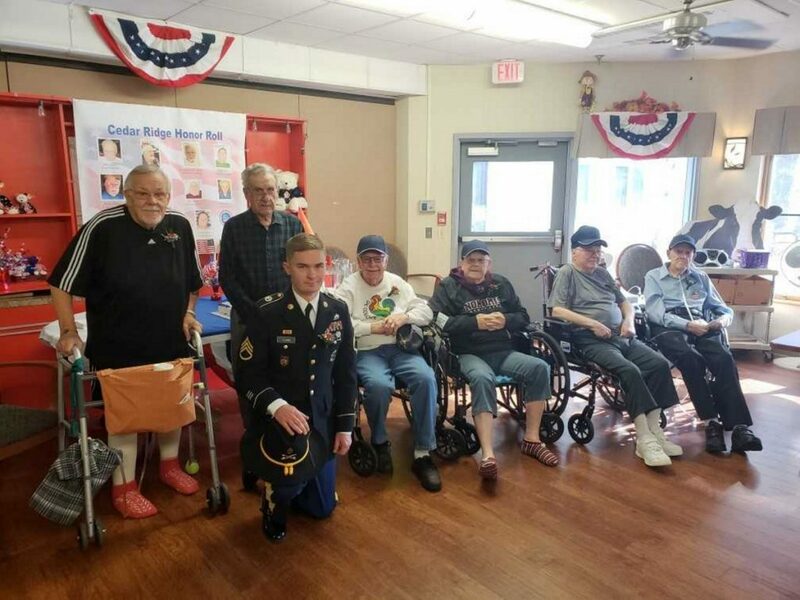 The veterans at Cedar Ridge Center in Skowhegan were celebrated Monday, Nov. 12, during the facility’s Veterans Recognition Ceremony. Staff Sgt. Brian Leard, United States Army Recruiter from the Waterville Recruiting Center, attended the ceremony and led the group in the pledge of allegiance and assisted recreation staff with pinning buttoners and passing patriotic ball caps out as gifts to the vets. The veterans included Freeman “Buzzy” Buzzell, Philias Johnson, William Burkhart, Frank Dore, Basil “Bud” Andrews and Robert Chadbourne. After the pinning ceremony country music singer Ray Stafford entertained the group and refreshments were served.